The first spring blossoms might seem a long ways off in these grey days of January, so do yourself a favour and add some freshness to your plate for that extra boost of Vitamin D to see you through the winter months. Natural foods high in vitamin D include fish oils, fatty fish, mushrooms, beef liver, cheese and egg yolks. Crops might grow slowly in these dark days of winter but, thanks to our mild maritime climate, many farmers and producers keep the harvest coming. Between the array of fresh pickings you can enjoy leeks, cabbages, spinach, root veg, watercress, lettuce, coarsely, chervil – making sure that your winter menus are anything but barren. Winter has a lot going for it, but fresh produce is usually not on that list. In colder climates, eating locally through the winter can be downright challenging. But we’re here with some good news: Every meal doesn’t have to revolve around potatoes and onions, even though they are delicious and are the maintain stay of many recipes. With a bit of advanced planning and creativity, it’s possible to eat fresh fruits and vegetables with plenty of nutrients and flavour all winter long. The main reasons for local, seasonal produce tasting good are that it’s grown in optimum conditions and it’s fresher because it reaches you sooner after being harvested and the stallholders at HFM are the growers themselves so pass on great cooking tips. As each year ends, a new season arrives, together with a supply of fresh ingredients that offer you comfort from the cold. From hardy root vegetables to bright, sweet citrus, winter produce delivers a surprising range of flavours for you to enjoy with family and friends. Haddington Farmers’ Market has over 20 stalls offering the best local food and drink and set against the wonderful backdrop of Court Street. The market attracts a loyal following, as well as appealing to day trippers. The stalls provide a huge variety of fresh, local and healthy produce for your everyday needs, for treats or as a gift. Particularly popular are our fresh and smoked fish; free-range meats and venison; bread; deli products; three cheese stalls; beer and apple juices. You’ll also find fruit and vegetables, chutneys and jams, cakes, eggs, honey and bespoke wooded crafts. Haddington Farmers’ Market takes place on the last Saturday of every month at Court Street, Haddington, from 9am-1pm. There is ample free parking behind Court Street and the market is a great venue from which to explore the market town of Haddington. 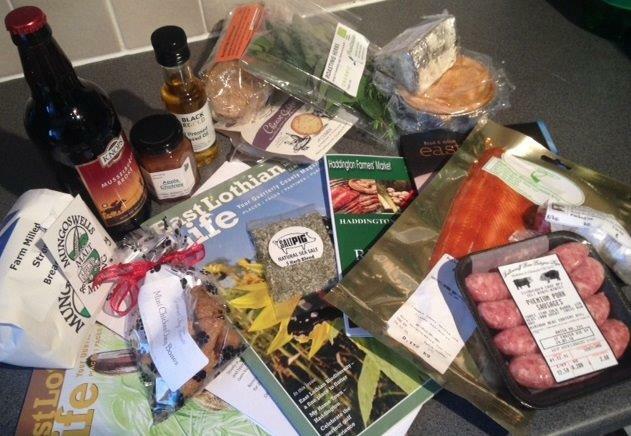 The January Haddington Farmers’ Market takes place on Saturday 30 January, 2016.